If there’s one thing everyone misses on a low-carb diet I would bet it’s bread. Am I right? I know it’s one of the things that I miss, especially with a meal that has Italian flavors. 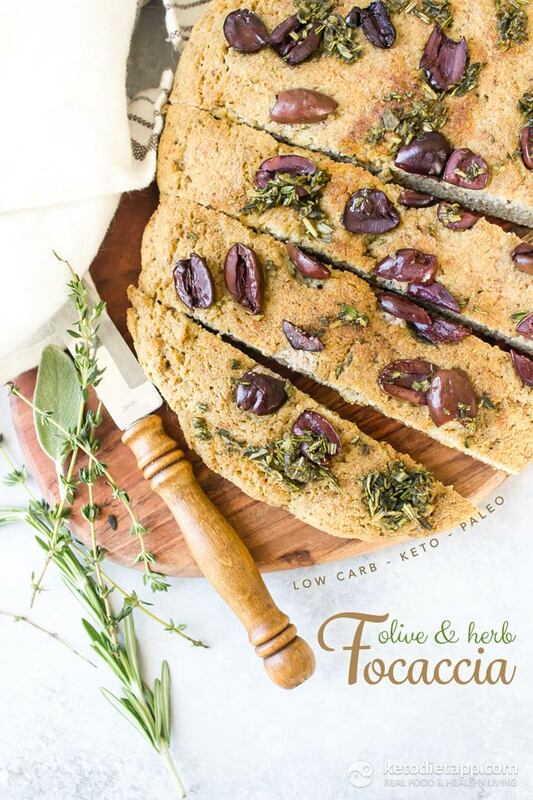 This Keto Olive and Herb Focaccia is a dream come true for a keto dieter. 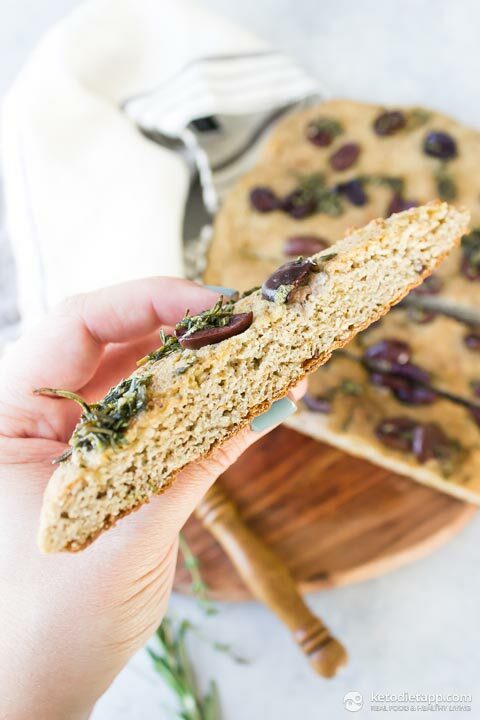 The bread can be used for sandwiches, cut into pieces and double baked for croutons, and eaten as is or with some seasoned olive oil for dipping (my favorite!). There’s also no super complicated steps, it’s a one bowl wonder and will be on your table in less than 30 minutes! The toppings are really customizable too. Olive and herb is my favorite but roasted garlic, jalapeno, or even cheese all work really well! What toppings will you choose? Note: For dairy-free, try plain coconut yogurt, or try coconut cream mixed with 1 teaspoon of lemon juice. Preheat oven to 190 °C/ 375 °F and line a baking sheet with parchment paper. In a large bowl whisk together the eggs and yogurt. Stir in the dry ingredients until a thick ball of dough forms. 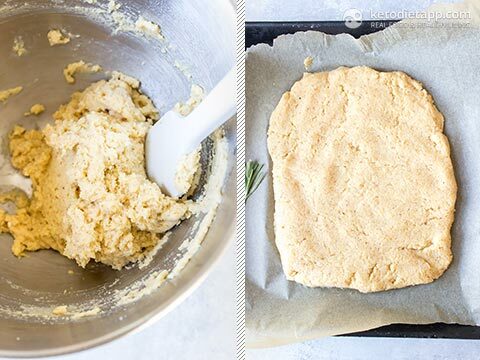 Transfer the dough to the baking sheet and form into a rectangle about 1/2-inch (2 cm) thick. Add the herbs, a pinch of salt, and the olive oil to a small pot and place over low heat just until the herbs become fragrant. 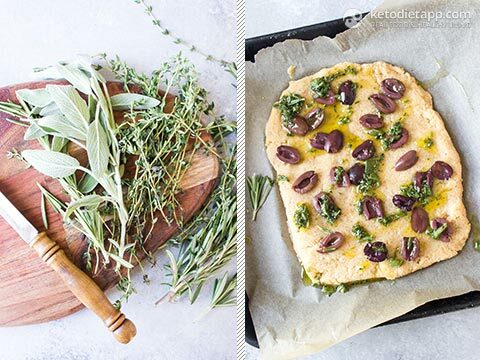 Top the dough with the olives and drizzle the olive oil over the top. Bake for 15 minutes then slice to serve. Store at room temperature for up to 3 days. I was hoping for some focaccia flavors... any guess where I went wrong? I found the texture to be too eggy and the dough was too yellow. I'll try it next time with 2 eggs less. It tasted good though. Hi Martina...made this bread today as per recipe..I did add dried mix herbs to the mix. It tastes good. My only problem is it didn't rise much...not as much as yours. What size loaf did you make as yours shows some rise/ volume. My loaf was 6x8 inches and about half inch thick.Any suggestions? Just made this, love the texture. It would make a great base for a thick crust/pan pizza! My dough was a bit moist so I added 1 Tb. of flaxmeal which gave it a "whole wheat" look. The bread holds together nicely and could be sliced length-wise to make panini. Martina - this was amazing! I’m Italian, and it wasn’t exactly like what I grew up with, but darn close enough! Thank you! Top marks for this recipe...thank you! I made this for the 3rd time today, only this time round I swapped out the yoghurt for butter milk and juice of one lemon. I had leftover butter milk that I needed to use up. I added a dash of garlic powder to the dry ingredients. I also grated cheddar cheese on top before putting it in the oven to bake. It turned out better than I expected. Thank you for all your recipes. They are easy to make and taste absolutely fantastic. These bread recipes are keeping me away from normal bread. Hi Sonia, you could substitute it but you'll need to use more (coconut flour is more absorbent than almond flour). Just by guessing based on other recipes, I'd go for 1 1/4 cup (125 g/ 4.4 oz) to 1 1/2 cup (150 g/ 5.3 oz) of almond flour. Man oh man, this is delicious! I used psyllium husk powder and dipped the final product in olive oil with pink Himalayan salt. Out of this world! I might try turning it into a pizza next time! Thank you! I'm most impressed by how this focaccia ends up looking. Seriously. It looks like something you would buy from a bakery or an artisan store - not something homemade and certainly not something keto. And, amazing food photography, as always. This is perfectly count as a healthy food and i love the olives. The combination of olive and bread is really good. This is best for health and fitness cautious person. I can't have psyllium. Is there something I can use instead? Thanks! Although I haven't missed ordinary bread I have missed Focaccia bread with anti pasta. I will be making this tomorrow when at home so a big thank you for the recipe. Glad to see a "bread" recipe without almonds. Why are you using whole psyllium instead of ground? Are you trying to get a chewier texture or is there some a chemical baking reason for the whole psyllium? Hi Missy! So the whole psyllium helps with the chewy texture which is what I was going for. Hope this helps!